Along with cash flow, generating new business and marketing, we know that HR can present a raft of challenges for small business owners. 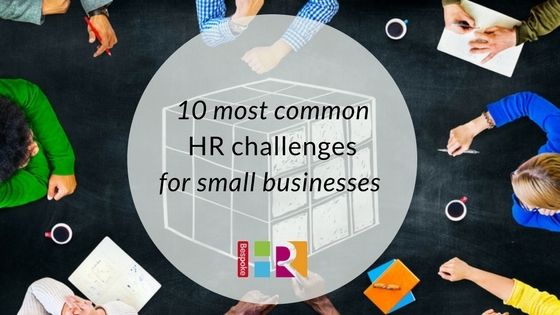 Working with small businesses for over 10 years, we have put together the top 10 most HR common challenges, and what you can do to overcome them. It can be hard to understand how and when to measure performance and develop staff. Start off by creating personal development plans, in consultation with your team members. Set objectives, goals and a realistic timescale. Line Managers assuming role of the HR with limited HR knowledge and training. This means ‘doubling up’ job roles to cover off HR. If your business is growing and you have no qualified HR professional in the company, then you should consider appointing one or outsourcing to a consultancy. As your employee numbers grow, you won’t be able to cover off HR in other roles and you will need proper support. Lack of resources / time to deal with any real staff issues or put effective policies in place. This could mean your HR practices are not up to scratch, and you could be exposing yourself to potential issues. Review your policies and ask for expert help if necessary to get your ducks in a row. In order to keep the best people, you need to provide the right support and training. Often staff are left to investigate training courses themselves, with resistance from the employer. Training should form part of the personal development plan which is set out for each member of staff. Finding the time and mechanisms to vet candidates and attract the right people. If you recruit through agencies you are facing cost implications, but if you recruit in-house you will have to set aside your time to vet applications. Employee referral schemes work well, where they can recommend suitable candidates in exchange for a reward, or outsource to a specialist HR consultancy who will also manage the interview process with you. Understanding best practice initiatives. Making a bonus or incentive scheme which is relevant, achievable, accessible and motivational. Often leaving these tasks to other members of the team. With legislation being so tight on employment law leaving HR to an untrained team member is a high-risk strategy and could be costly. Knowing how to deal with this and the legal standpoint. Sickness costs the company money and causes delays in efficiencies. Companies often leave employees when they are off sick – out of sight out of mind – this is the wrong strategy, and the issue needs to be dealt with in a timely fashion in line with best practice and sympathetically. These can become out of date very quickly. These are all legally binding documents, so they must be relevant, current and useful in order to add value to the business. Where do you start whilst legally protecting the business? Robust systems, the right people and the right culture all build toward protecting the business. However if conflict arises, it is essential to seek professional advice immediately. If you’re worried about your company’s HR policies, take our HR Diagnostic Test to see how it fares. This will give you suggestions on where you need to improve, and what you can do next.